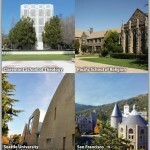 Disciples Seminary Foundation, an Open & Affirming Ministry, works with four partner seminaries on the West Coast. I don’t know about you, but I procrastinate and leave those important conversations to “mañana”. Because of this, I never came out personally to my mentor and friend, Ferdinand García. So this is an attempt to tell him how I feel about him and La Convención in the North East. You were like a father to me, the father I never had. I was a proud daughter then and now. It does not matter how much we disagree, I love you dearly. I remember the times when you and I were on the same side and brought that shameful resolution to the Oswego, NY Regional Assembly. We won, but somehow I felt bad. It did not take long to know why; you see I saw two men embrace and cry, because their future had been derailed by La Convención, by me and you I felt their pain…and my soul was moved to ask questions in order to understand their pain. I did not know then that I was beginning my own journey. Ferdinand, I spoke to so many people and read so many books looking to validate my beliefs, but the outcome was surprising. I must tell you that I was so angry with the church when I understood what the story of Sodom and Gomorra was all about, inhospitality. Did you know this? You may have known, and it did not stop you from using it against the homosexuals. I used my new knowledge to become an advocate for change within La Convención and the Hispanic church. My new posture did not go unnoticed and the persecution began. How did you feel every time someone spoke my name with disdain and hatred? Did you defend me? Did it hurt you? I remember one day at your little office in La Hermosa church, you asked me why was I so passionate about advocating for the inclusion of gays in the church? I answered that I had learned to follow my convictions and faith from the best-him. You did not say a word, and I just left. Later you told someone that I had shut you up; how can I answer that! On another occasion sitting in the same office, you asked me not to go to my last meeting of the Hispanic Caucus in Indianapolis. You said that they were going to confront you and you did not want them to hurt me. I knew what they wanted to confront me about, but who told them, was it you? Were you trying to protect me or trying to protect yourself from taking sides? Anyway, you had nothing to worry about, because my sister was gravely ill and I had made the decision to go to Puerto Rico to be with her. To this day I regret that decision. I should have gone to that meeting. Maybe something good could have come out of it. You, for once would have had to call me a sodomite to my face and I would have… cried. I also know how you went behind my back and worked your magic to remove me from my leadership positions in La Hermosa. You spoke to the leaders of La Convención and the Hispanic Caucus and I was distanced like a leper. Yes I was a leper who had to be kept away so that she would not disperse the germs of justice, inclusion and love. This church was my family and I was been thrown out and my father had done most of the work. That was so painful. In 2001 I went to the GLAD Pre-Assembly event and there I met the most amazing woman being and the love of my life, Nancy Brink. She remembers working with you on the UCC/Disciples partnership Committee. I wish you would have had the opportunity to see us together. We are a wonderful couple. We love and respect each other like you and Salome did. Our love comes from our Spirits which bonds us in a way that can only be called divine. You would have been so proud and I have no doubt that you would have come to love her as well. You told me once, when you were close to death, that you loved me like a daughter. I don’t remember what I answered, but let me tell you now. ILOVE YOU AND I FORGIVE YOU. Please FORGIVE ME, for not having the courage to have this conversation in person and give you the opportunity to change your heart.